From the Riley collection by French fashion house Marc Jacobs, this stylish timepiece flaunts a rose gold tone case, and a beautifully complementary taupe silicone strap. In addition to being a show stopping fashion accessory, this touchscreen smartwatch also has a number of impressive features. The Riley touchscreen smartwatch is compatible with both IOS® and Android™ phones, powered with the Wear OS by Google™ smartwatch platform. The smartwatch connects to your phone via Bluetooth and offers user friendly notifications, messaging and downloadable third-party apps. Receive calls and texts, access your music library, track you daily steps and calories and much more with this smartwatch perfect for the fashion forward modern-day woman. 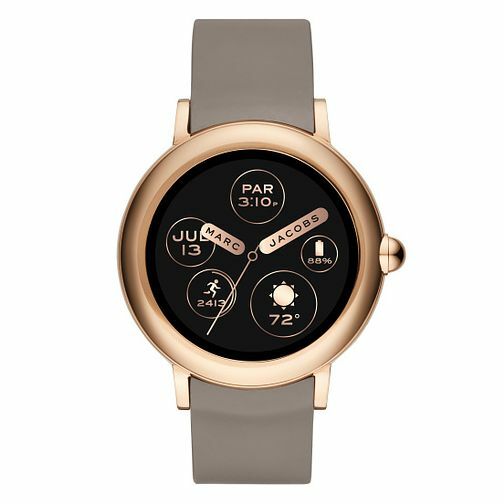 Marc Jacobs Riley Touchscreen Rose Gold Tone Smartwatch is rated 4.0 out of 5 by 1. Rated 4 out of 5 by Anonymous from Pretty looking watch Stunning look of this watch is what caught my eyes. I bought it to count my steps mainly which seem slightly inaccurate to me,however it's very useful for notifying calls and msges. It says online that it has choice of 72 faces but I do not have all of them in my watch. I am not sure if it requires download but even play store don't seem to have MJ app to downlaod extra faces. I like tgis watch very much but I would like to know how do I get 72 faces? Which information is not available anywhere.